The article in The Times by Henry Winter on Matt Cunnington. 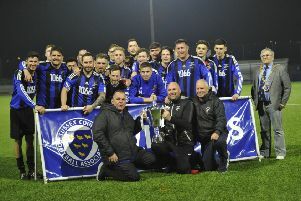 A former Hastings United youth and Bexhill United footballer was featured in the national press this week. Matt Cunnington was the subject of a full page article in The Times on Tuesday by chief football writer Henry Winter about his remarkable story to come back from a brush with death to continue playing the game he loves. Matt’s father Mark Cunnington met Winter on Sunday after sending him a copy of his book, The Fear, to read. Impressed by the book, Winter asked to meet up to do piece on Matt’s amazing footballing story. The article recalls how, when aged 13 and a promising left-back on the books of Brighton & Hove Albion, Matt’s heart stopped beating for 17 minutes in the middle of the night. After six charges with a defibrillator, Matt finally stirred and the paramedics sped him to A&E, placed him in an induced coma and then transferred him to St Thomas’ Hospital in London. As the day wore on, medics decided to start bringing Matt out of the coma and when mum Karen tickled his feet trying to get a response, he suddenly shouted ‘get off my feet’. Matt had a pacemaker fitted, but was cleared to play football by a consultant at St Thomas’ and The FA. He was reintegrated into Brighton’s youth set-up and although eventually released, he was then snapped up by AFC Wimbledon. Matt was later recruited by the University of Bath, which was looking for an attacking left-back, and while there gained a 2:1 degree in sports performance. He scored three goals and produced some eye-catching displays for Macron Store Southern Combination Football League Division One club Bexhill between September and December 2016. The 22-year-old is now playing semi-professional football in Melbourne, Australia.